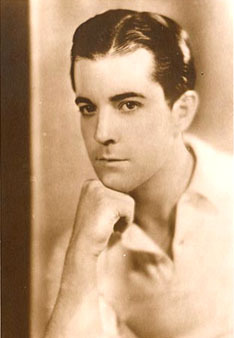 Novarro was a silent star who successfuly made the switch to talkies. His first break was Scaramouche but he is best known for being cast as the lead in Ben-Hur, when all the filming on that picture was scrapped and re-shot. Novarro's salary at the peak reached $10,000/week. Scandal erupted in 1968 after Novarro was beaten to death at his home by a pair of teenage boys, Paul (age 17) and Tom Ferguson (age 22). Hollywood Walk of Fame 6350 Hollywood Blvd. The Pagan (27-Apr-1929) · Henry Shoesmith, Jr.